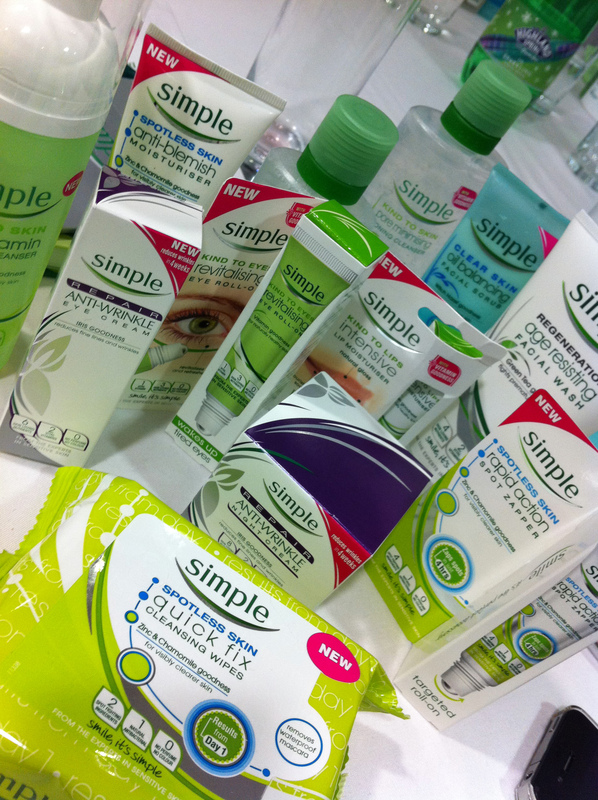 On Friday I went down to London for an event with Simple, the skincare brand. The event was hosted at the Good House Keeping Institute (at National Magazines HQ) and I went with a friend thanks to Cosmopolitan magazine. 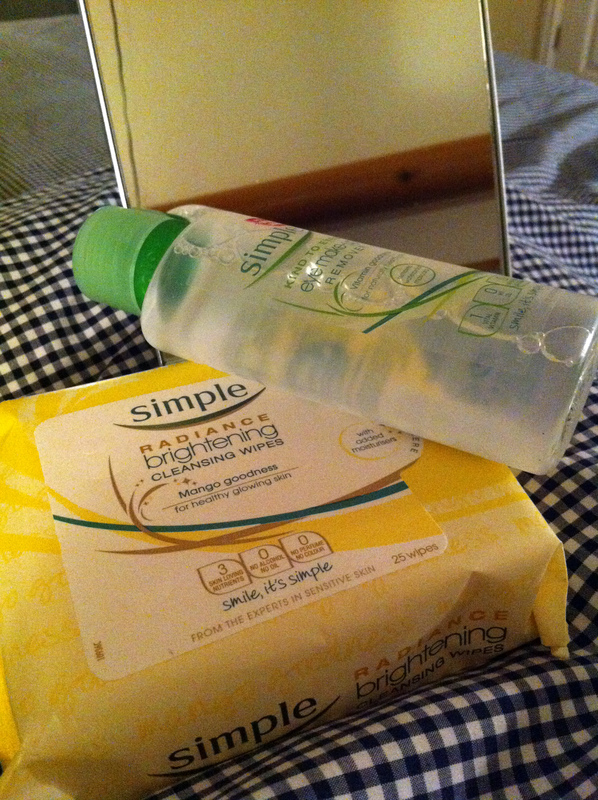 Simple was founded in 1960 as a soap that used no perfume and no chemicals. In 1978 it was the first skincare brand to have the idea of “cleanse, tone and moisturise” (yes, that was Simple, not Clinique or any other brand). Today Simple has seven ranges of skincare, and as a company continues to have a strong belief that harsh chemicals, colours and perfumes should not be applied to our skin. The day was all about skin health. It was a series of four workshops run by Simple’s Advisory Board – four knowledgable specialists in different aspects of health that all affect our skin – mental wellbeing, nutrition, skincare and fitness. Living with stress is a part of everyone’s life (tell me about it! ), and the fact is that when we are stressed our physical appearance and skin condition is affected. The reverse is also true – those with problem skin find it causes stress and anxiety. Psychologist Dr Chris Bundy showed us how state of mind and living with stress can have an impact on our skin health with quiz to find out what flower we were. We had to decide what our first reaction would be in four different difficult scenarios, and as a result were labelled either an Orchid, Lily, Rose or Daisy. It turned out that half the time I was a Rose and the other half I was an Orchid… suggesting that half the time I was out of control with stress and anxiety and half the time I was calm and organised. Ok – I’d say that was pretty accurate! For me, then, I need to think about being an Orchid when I feel the Rose taking over… or something like that! 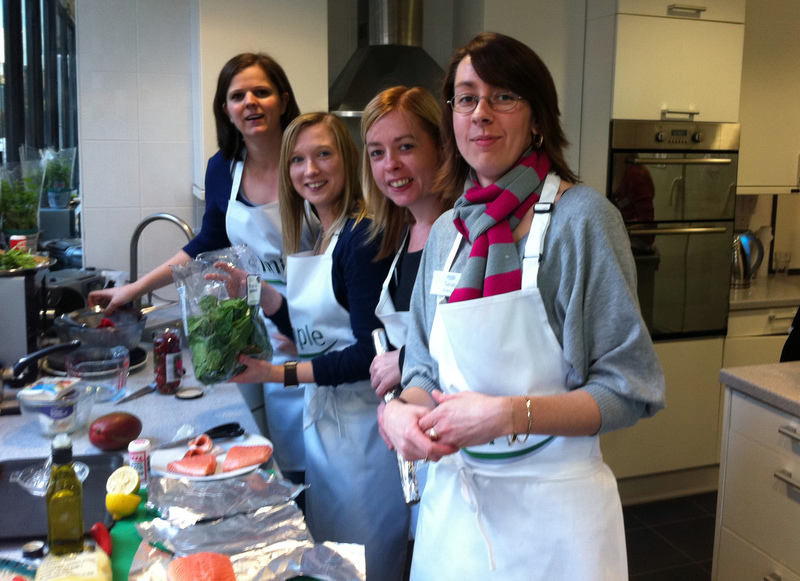 I never thought I’d say I’d been cooking in the Good Housekeeping Institute kitchens… well I did! For the nutrition workshop Fiona Hunter gave us a Ready Steady Cook challenge with skin-loving ingredients. We were taught that diet plays a very important role in skin health – a balanced diet not only affects our weight and internal organ function, but also our mental health and skin condition. Poor diet can be shown in dull, flaky skin, tired eyes, dark circles, break-outs and of course weight gain around our neck and face (and everywhere else!). Our little group of four didn’t win the challenge but we had a good go. We were challenged with a main course (there were six groups in total – two for each course). 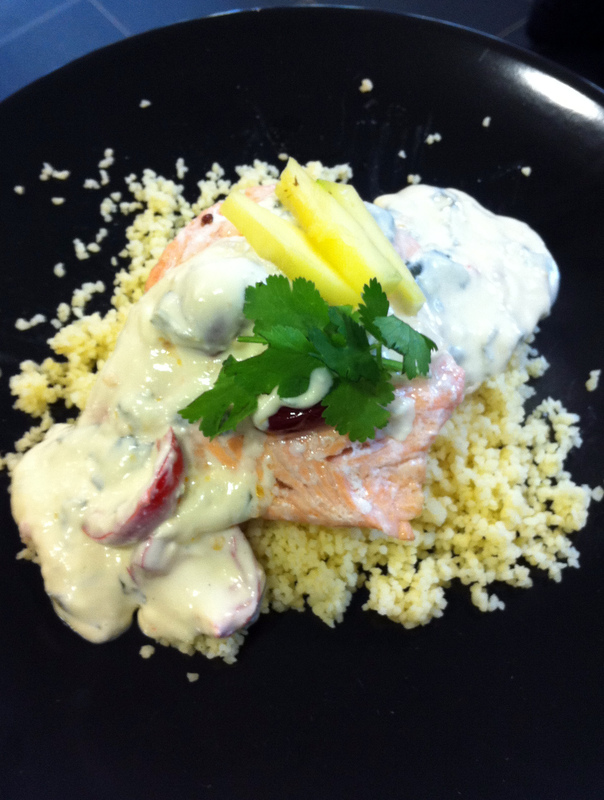 We cooked with salmon, cous cous, spinach, feta cheese, creme fraiche, mango and cherry peppers – all of which contain things that can help with healthy skin, hair and/or nails. Actually what we cooked (we called it “hot salmon”) was really tasty and I’m planning on trying it at home some time. We enjoyed the challenge and really enjoyed tasting everyone’s creations at the end of the workshop! The rules we were given were of course five portions of different fruits and vegetables a day (veg is better than fruit because there is less sugar, but fruit is still good), reduce bad fats, and eat properly. Make-up artist Caroline Frazer showed us what a Simple skincare regime looked like by doing a demo, and we were each given a big bag of products that were chosen for our skin specifically (we’d filled in a questionnaire the week before) to try at the same time. Of course that meant taking our makeup off and I admit I was a chicken there so I stuck with trying some products on my face and others on my hand. Caroline stressed the importance of spending a little time each morning and evening on our face (and neck/chest – which apparently is where we age first), not only to remove impurities and look after our skin, but also as a time for ourselves to de-stress. She explained that the act of cleansing, toning and moisturising doesn’t just keep skin clear and healthy, but it also improves the tone, texture and of course helps fight the signs of aging. And of course, healthy skin is the perfect canvas to apply makeup and also helps with your mental wellbeing. The main message in this workshop was that we only have one skin so we should spend time looking after it. Now my skin is pretty rubbish… I was hoping she’d give me a miracle cure to all my skin problems, but basically no, it was about keeping it clean and using the right products in the right areas for my needs. One thing I did learn was that I should cleanse twice in the evening – once to remove my makeup and once to cleanse properly. I can do that! The selection of products in my bag was very interesting – a real combination of different ranges including Kind to Skin, Spotless Skin, Regeneration and Radience. We were challenged to use the products and see if it made a difference to our skin health, and of course I’m willing to give that a go. Anyone who has ever read my blog will know that fitness is something I strive for, and running is my chosen method at the moment. Julia Bishop explained that exercise results in the body releasing endorphins which lifts our mood and also increases blood flow to our vital organs – including our skin – and boots our immune system. Having a healthy body is directly reflected in our skin giving a clear complexion as well as improved skin tone and condition. So, exercise plays a massive role in how our skin looks and feels. Intensity: Work as hard as you possibly can on every exercise you do – you should be completely worn out at the end of your routine. If you are not puffed out and sweating you are not working hard enough so kick it up a gear! There is no point exercising if you don’t break out into a sweat or bring your heart rate up, it’s making no difference to your body. Variety: This is important to keep you interested but also, doing the same programme all the time will allow your body to become accustomed to it and it will stop making a difference to you. Constantly try new things – change the order, change the exercise type at least every six weeks. Quality over Quantity: Concentrate on what you are doing! When you exercise think about the muscles you are working and ensure you perform the full range of motion in a deliberate manner. Oh and breathe! Breathe out during the difficult part of the exercise. Consistency: Don’t give up, keep going, and you will see results. Rest: She explained that exercise is the architect and rest is the builder… so exercise breaks down our muscles, and they rebuild themselves afterwards when we are resting. This means that we shouldn’t train the same muscle group two days in a row (but doesn’t mean that we can’t exercise two days in a row!). Julia also said that we should absolutely cleanse before AND after a workout – blocked pores lead to break outs and so we should not exercise with makeup on and should make sure we remove the impurities released from our skin in sweat when we’re done. I’m keeping wipes in my kit bag now! The day was about balance. In order to look good we need to remember that mental wellbeing, nutrition, skincare and fitness all matter. In fact everything matters. If one thing is out of sync then it will show on our faces – literally in our skin condition. I know this was a Simple event and so Simple were of course peddling their wares too, but what they were saying about the hollistic approach to looking after yourself made complete sense to me. I may not have learnt anything completely new, but it did stress how I need to remember to keep everything in check. As someone with poor skin condition on a good day I hope that if I take all these things into account I might see an improvement in my face and I might feel a new me. Thank you Simple for a good day, I’m really glad I made the effort to attend. Oh and of course thank you for the bag of products you gave me too, I will do as instructed and give them a go for a while alongside your other tips and see what happens (watch this space!! ).